In a recent interview, McLaren‘s former head of communications, Matt Bishop, recalled those dark, dreadful days at the end of 2007 in the wake of Spygate. Fined $100m, excluded from the championship standings and its reputation in tatters, Bishop admits that there were serious concerns regarding the team’s survival. However, the following season got off to the best possible start, with Lewis Hamilton winning the opening race and going on to win the title. While that win in Melbourne in March, and the subsequent title win, lifted the Woking outfit out of the despondency of late 2007, one wonders what it will take to lift morale as the team’s current nightmare continues. As Bishop reminds us, Jenson Button‘s win at Interlagos in November 2012, remains the last time a McLaren driver stood atop the podium. After three dreadful seasons with Honda, things have been little better this year with Renault, the Woking team having done enough in the opening few rounds to keep it ahead of a Racing Point Force India which only contested the final nine races, and an ever-improving Sauber. Zak Brown, the man charged with steering the team through these deeply troubling times, while admitting to the current malaise, insists that things will get better. “I think we’re now on the road to recovery,” he tells the official F1 website. 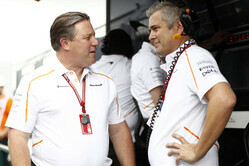 “As I tell the men and women at McLaren, it’s going to feel good before it looks good. “Meaning that they’re doing some great work now but until you see the race car on the track so I think it kind of feels good inside McLaren,” he explains, sort of. “Development is going well, teamwork, collaboration, communication, responsibilities, all those things that we fell short of are now going well,” he insists. “But until that race car hits the track that’s the ultimate measurement and that’s when everyone will be able to visibly see what type of improvement over the winter. Which of course begs the question, how much time does one need? At a time Red Bull is preparing to team up with former engine partner Honda, Brown says he is happy with Renault. Thwarted in its attempts to get Toro Rosso technical director James Key on board sooner rather than later, the Briton will have no impact on the MCL34, though Brown is looking forward to his arrival. “James will be with us next year,” he says. “You’d rather have James working for us now than not, obviously. We’ve recruited him because he’s immensely talented. However we knew that that was going to be the case and think that Pat Fry, Andrea Stella and the whole design team are working really well together.